To help mark the last Auto Assemble convention in the UK all the guests and some of the Artists who brought us the Transformers comics going back to the 1990s Marvel run have signed this limited edition Lithographic. The artwork comes from Andrew Wildman who has worked on the original Transformers comics and drew a version of this poster back in 1991 for the UK Transformers comic. For those who have been lucky enough to meet Andrew Wildman at a convention will know he’s probably the nicest artist you can meet. He has an awesome portfolio of work from Spider-man, Venom and Black Cat to Gi-Joe and Transformers. He’s always doing sketches for fans and this is one of many auctions he has done for charity. We won’t see many posters like this especially with it being G1 and signed by some of the biggest names in Transformers at the moment. It’s full A1 print size and limited to 200 with only a few of them signed by the whole line-up of Auto Assembly. Out of the 200 both 0 and 1 are currently on ebay up for auction with all profits going to the Children’s Make a Wish Foundation. Print number ‘0’ from a limited edition by Transformers artists, Andrew Wildman and Jason Cardy. This print is a reimagining of an Andrew Wildman poster that appeared in the UK Transformers Comic in 1991. Small changes to the featured cast have been made to best reflect the entire G1 Transformers storyline that concluded with the recent IDW series, Transformers Regeneration One. 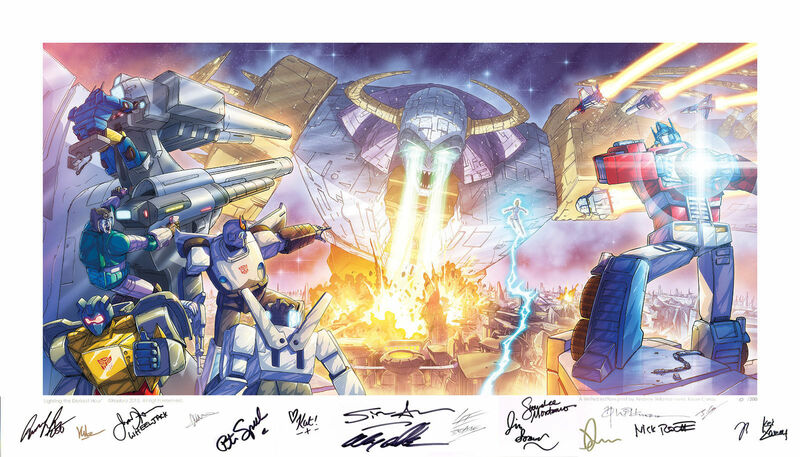 The print is numbered and signed by not only the artists but also all attending Artists, Writers and Voice Actors at the recent UK Transformers Convention, AUTOASSEMBLY. Peter (Skybite) Spellos, James (Wheeljack) Horan and Sumalee (Arcee) Montano. Simon Furman, James Roberts, Nick Roche, Alex Milne, Andrew Griffiths, Kei Zama, Andrew Wildman, Jason Cardy, JP Bove, Lee Bradley, Kris Carter, Alies Meerman, Kat Nicholson and Jim Sorenson.